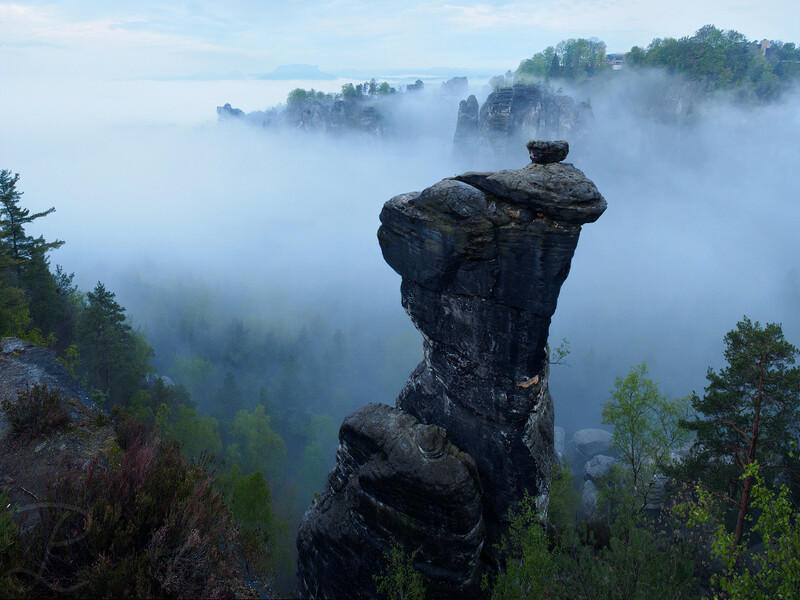 At the beginning of may I went to Saxon Switzerland with my buddies Alex and Jan with the hope to get some impressions of spring back home. Besides driving to some locations with the car we went on a 3 day hike in the park. We got really lucky with the weather, on the first two mornings we had beautiful layers of fog covering the lower areas of the park and during the day we had warm and sunny weather, perfect for hiking. I’m already sure to go back there in autumn to get some shots with a different palette of colours. Can you spot the castle in the sky far away? The title has been obviously inspired by one of the best anime I've ever seen, directed by genius Hayao Miyazaki. 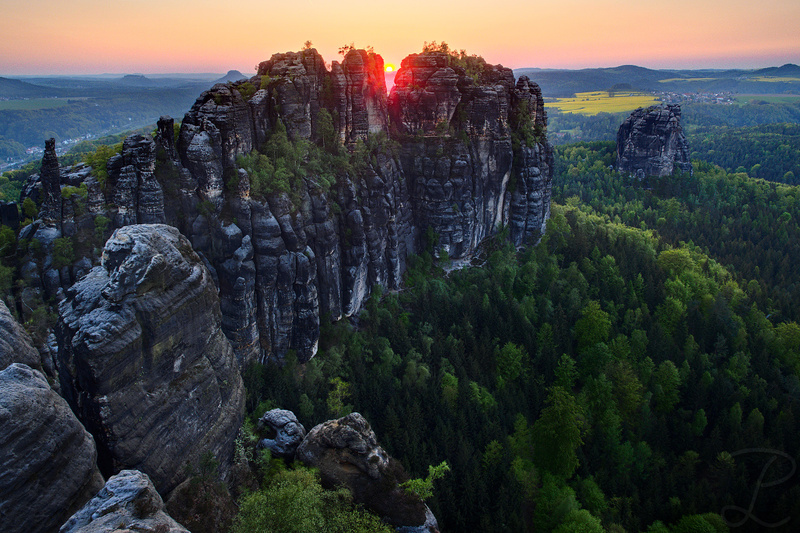 I took this image close to the famous Bastei​ in the Saxon Switzerland​ national park. Can it get any better when you have those conditions after the first night? The river Elbe did an amazing job cloaking the towns around the riverbed in beautiful fog. 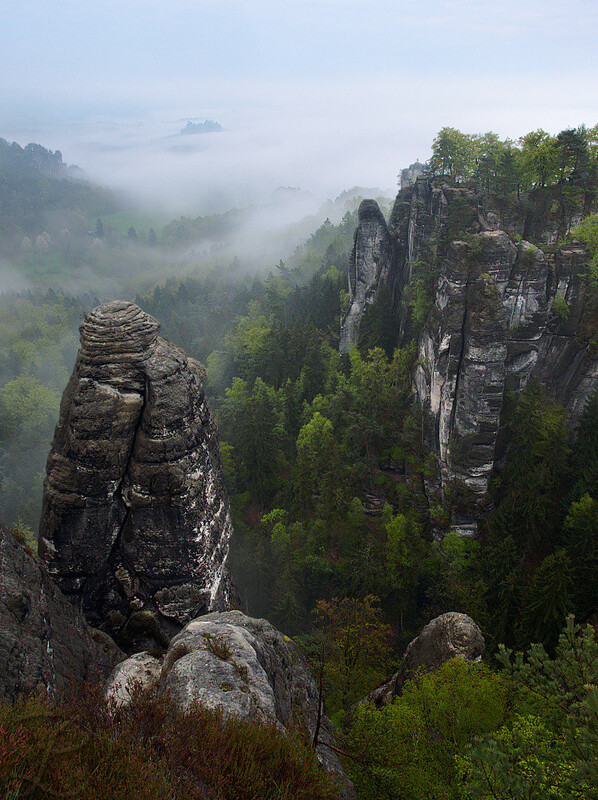 A view which is not so rare in the Elbsandsteingebirge - Sächsische Schweiz national park. After scouting this place in the night, Alex and I only had left a few hours of sleep before heading out again to be in time for blue hour and sunrise. On the next morning we woke up to beautiful foggy conditions. 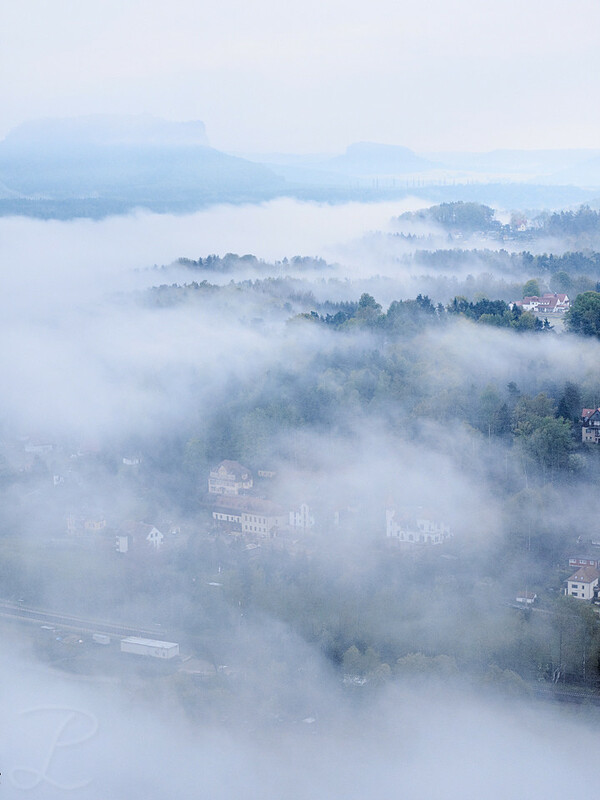 We already expected fog but didn't imagine such a dense layer of fog, which was a nice welcome surprise on our first day in the Elbsandsteingebirge - Sächsische Schweiz. 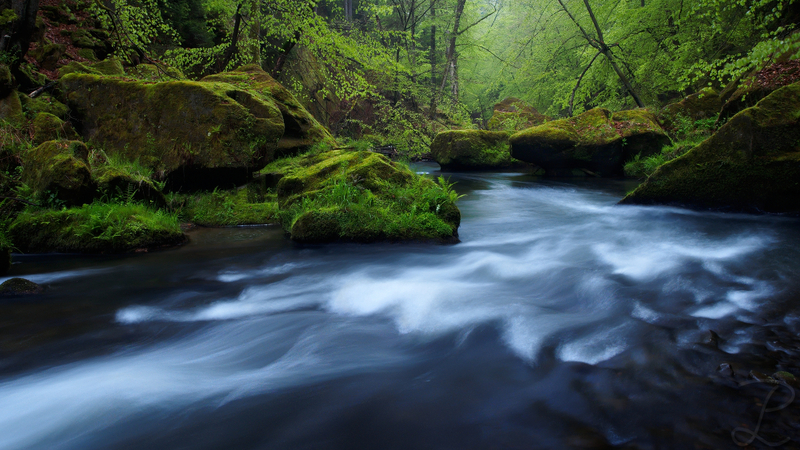 During the first day when we arrived in Bohemian Switzerland we had plenty of rain and an overcast sky. Good for us, because we had the ideal conditions to pay the Kamnitz Gorge (Edmundsklamm) a visit and were blessed with beautiful lush and saturated colours. Because we went to the gorge quite late, like only a few minutes before sunset, we had the gorge to ourselves. Therefore we could totally enjoy the peaceful atmosphere there. 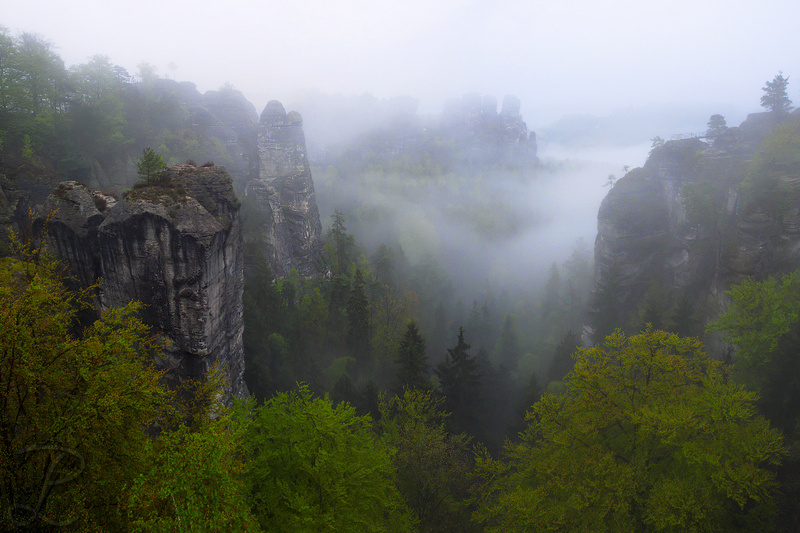 This entry was posted in Nature & Landscape, New Pictures, News, Travel, Trips and tagged bohemian switzerland, böhmische schweiz, edmundsklamm, elbsandstein gebirge, elbsandsteingebirge, fog, foggy landscape, Gorge, kamenice, kamenice gorge, kamnitz, kamnitz gorge, klamm, nebel, sächsische schweiz, saxon switzerland, sonnenaufgang, sonnenuntergang, sunrise, Sunset, Water, wehlnadel on 05/05/2016 by phil.